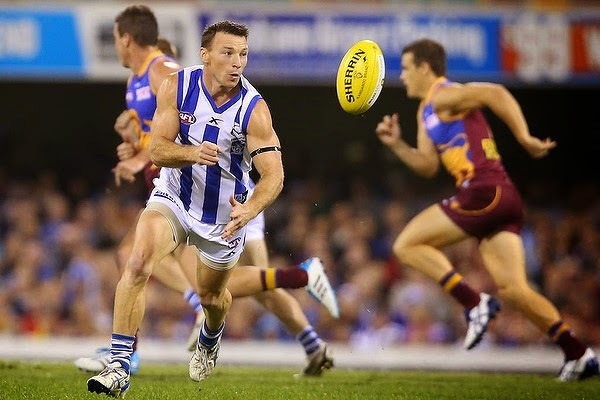 North Melbourne veteran Brent Harvey isn't sure why the same basic mistakes keep tripping up his side, but he's still confident the Kangaroos can overcome them. North's maddeningly inconsistent season hit a new low on Saturday, with a 55-point loss to cellar-dwellers Gold Coast, leaving them 11th on the ladder with a 6-7 record and Harvey admits Monday's team review wasn't pretty. "It's some basic stuff that we've really got to get right," Harvey said. "We'll never be a really good team if we don't get the basics right. "We're too inconsistent and to challenge the good teams you can't have that inconsistency week in week out or (from quarter to quarter). "We can turn that around, but to be honest - and I'm not being smart - we're over that game now and we've got to move on because if we don't we'll get our pants pulled down against the Cats." North Melbourne supporters will find it difficult to move on from their club's fourth loss of nine goals or more in a season where they were widely expected to push for a top-four finish. After bowing out at the preliminary final stage last year, the Roos appeared to get stronger when they topped up with veteran free agents Jarrad Waite and Shaun Higgins. Harvey admits the club's current ladder position may suggest otherwise, but maintains all is not lost as they prepare for a pivotal clash against Geelong. "I'm always confident that we'll bounce back," he said. "When we've got our backs against the wall we probably play our best football. "But for our supporters we'll be bouncing back, we'll finish off the year well and we'll go from there." Harvey is nearing his 400-game milestone and the 37-year-old still plans to play on next year but will make a final decision with the club's hierarchy in about a month's time.